Welcome to OSM! Different maps update at different rates; it'll appear on OSM's "standard map" shortly and the cycle and transport layers within a couple of weeks . 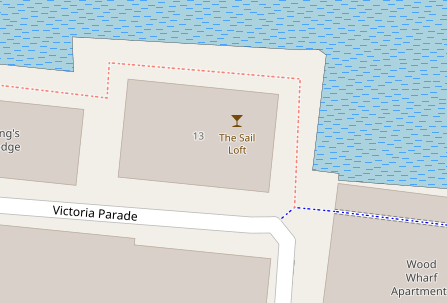 It already appears at this map. Incidentally, if it's more of a pub than a bar you might want to use "amenity=pub" rather than "amenity=bar". Also if it serves real ale then add a tag such as "real_ale=yes" (I'm guessing that it does if it's a Fuller's pub). Try re-clearing your browser cache or try a different browser. Add a new node to an existing area in iD editor?